During the year, business sentiment gradually grew more positive. Spurred by more jobs, higher asset prices and higher investment levels as well as increased trade, the world economy geared up, despite heightened geopolitical uncertainty. However, large global imbalances remain and central banks face a difficult balancing act in returning to a more conventional monetary policy. Most SEB customer segments increased their activity levels. Large corporates benefited from favourable financing conditions. IPO and M&A activity picked up. SME customers in Sweden and the Baltic countries increased their demand for lending. SEB aspires to be the leading Nordic bank for corporates and institutions as well as the top universal bank in Sweden and the Baltic countries. SEB plays a crucial role in the development of more sustainable society and is today the only Nordic bank included in the Dow Jones Sustainability Index. SEB is a leading bank within green bonds and one of the leading managers of micro finance funds, with more than 6 billion SEK in assets under management. Of SEB's own funds, more than 25 per cent are managed according to sustainable criteria. During 2017, one of SEB's funds was awarded with the Nordic eco-label Svanen. 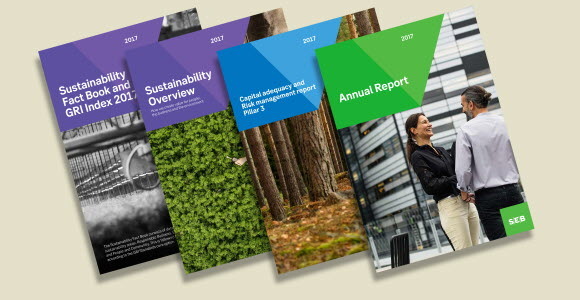 This year, the sustainability report is included in the annual report. Besides the report, SEB also publishes highlights, ambitions and results in a sustainability overview of 2017. The report on capital adequacy and risk management describes the bank's current risk position in terms of the greatest risks, how risks are managed and measured, and provides information on the bank's capital position and capital adequacy.